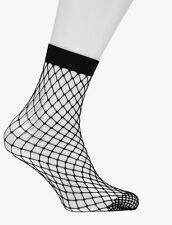 2 Pairs of high quality Fishnet Socks. LYCRA SOCKS. 55% COTTON, 22% POLYESTER, 22% POLYPROPYLENE 2% LYCRA ELASTANE. 6 PAIR LADIES SOCKS. COTTON BLEND SUPER FINE. PLAIN BLACK. You get 3 pairs of Ladies Gentle Grip Non-Elastic Cotton Socks with HoneyComb Top. Soft Touch Cotton. Cotton Rich. Honeycomb Top - leaving no nasty rings.